except for hot and cold symbols. any position on reel 3 at the same the time, the tornado feature will be triggered. 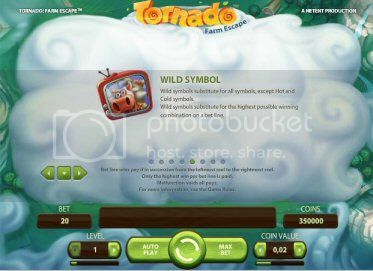 reel becomes active and the tornado will collect all active and wild symbols. ends when a spin contains no active or wild symbols. direction generating wild symbols until it moves outside the reels area. of 100% up to &#8364;300. I've grown a bit tired of Net Entertainment slots over the past year but this has slightly rekindled my interest. Reminds me of a US prairie version of the movie Chicken Run! Thanks for the input Zabier, I know what you mean I find that with some too, you just feel like they are very similar with different images.